Features of factory price Superior Quality for EDM Wire Cutting. 2.Diameter tolerance is kept to +0 ~ -0.002mm and circularity within 0.001mm. 4.We test each spool for curling and torsion and pride ourselves on the stable automatic wire threading performance or our product. 6.Tensil strength, elongation, breaking load, etc. are checked with automatic measuring equipment to ensure stable quality. 8.A unique quality control system involving special diamond wire drawing dies and lubricating oil ensures that BS wire has an extremely smooth surface, free from irregularities, dirt and scratches. Product Details of factory price Superior Quality for EDM Wire Cutting. EDM wire is composed of standard brass CuZn37. Our product is widely used by WEDM and has outstanding straightness and clean surface. EDM wire performs excellent AWT(Auto Wire Thread) on any type of WEDM preventing flaking during cutting workpiece. EDM wire dia. is 0.1-0.33mm with different price. Passed GJB9001A-2001 military quality certificate. China Manufacturer Superior Quality for EDM Wire Cutting. Vacuum packing, sealed with PVC cellephane, moisture proof, quakeproof, and corrosion resistance. The Specification of factory price Superior Quality for EDM Wire Cutting. 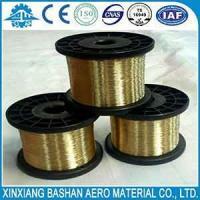 Good and reliable raw material is the most important factor of producing excellent fine stainless steel wire. Bashan company use good raw materials from well-known iron manufacturers at home and abroad. Ugitech in France, Hikari Works in Japan, Tisco in China, D&B Special Steel in China, Ruipu in China, etc. Basahn factory affiliated to China Aviation Industry Corporation (AVIC), is the only professional military manufacturer of stainless steel wire, metal wire mesh, filter element, special filtration component and wire thread insert. 1) 800 tons of stainless steel wire of medium and fine wire.3600 tons of coarse wire above 1mm in diameter. 2) 500 thousand square meters of high precision wire cloth in nominal aperture sizes from 6.00 to 0.02mm. 3) 10 million pieces of thread inserts, including free run type and screw-locking type with ranges of M2-M45mm. We have a professional warehouse management system to ensure the safe storage of our products. We carry out a strict quality management system in accordance with ISO9001,TS16949,ISO 14001. 3)Passed GJB9001A-2001 military quality certificate. Packing and Delivery of factory price Superior Quality for EDM Wire Cutting. Packing Details of factory price Superior Quality for EDM Wire Cutting. * Pallet / Wooden Crate. Processing & Delivery Time of factory price Superior Quality for EDM Wire Cutting. * Common products in 2-4 days. * Special products according to Contract. * Small package is shipped by Air, DHL, FedEx etc. * Big size package is shipped by sea, 10-30days. * If no Stock, please contact the supplier to confirm it. * Trade term: EXW/ FOB/ CIF. The main market of factory price Superior Quality for EDM Wire Cutting.